This RCA to F-Type Connector fits in all On-Q keystone wall plates. The RCA jack on the front allows easy connection to an audio/video component, and the rear F-type coaxial jack allows for in-wall cable runs using shielded RG-6 cable. Great product for an easy install of sub. WITH THIS product how would you attach the speaker in-wall wire to the f-connector side? Product Overview: This is an On-Q keystone insert designed to be used in an On-Q keystone wall plate. It has a gold-plated F-type connector on the inside and a gold-plated white RCA jack on the outside of the insert. In addition to this insert you will need the appropriate in-wall wiring, along with either a standard keystone wall plate or an outlet strap with a decorator wall plate. Installation Overview: The OnQ Keystone connectors (available in F-type connectors, Cat 5/RJ-45, Speaker screw terminals and binding posts, and multi-colored RCA jacks) provide terminals for in-wall audio and video cables in a single-gang or dual-gang box. Outlet straps and standard keystone wall plates, into which the keystone connectors snap, are available in 1, 2, 3, 4, or 6 port versions. When using an outlet strap, a matching decorator wall plate covers the outlet strap and wiring for a clean installation. You have to terminate the wire with corresponding RCA jack. 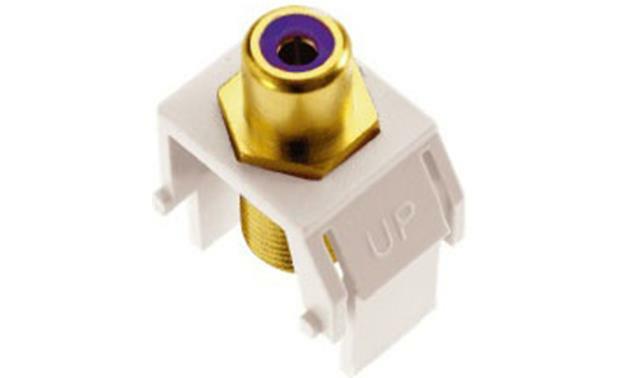 The jack you want is the type used by cable companies to terminate cables that plug into cable boxes -- that is, a jack with a hex head that screws onto the terminal on the cable box and in this case on the back of this jack (facing the inside of the wall). Notice the threads on the inside-of-wall face of this connector. The inside-the-wall is for coax cable, not speaker wire. When I had questions I called up an advisor, they were very helpful, and exceeded all of my hopes and expectations. I have RG6 installed for my subs, for which these are used. Searches related to the On-Q RCA to F-Type Keystone Connector .